Westcoat’s waterproofing systems offers both practical and decorative solutions for almost any type of elevated surface. With unique systems developed for plywood and concrete surfaces, Westcoat offers some of the best products on the market. Westcoats waterproofing systems, offers a wide variety of selection for you to choose from. The waterproofing system is both durable and waterproof. Designed for heavy traffic areas such as balconies, corridors, stairs, landings and interior floors, this system provides a durable system to help protect plywood surfaces. Formulated for plywood surfaces, the ALX system integrates the finest acrylic resins and cement blends into a reinforced, galvanized metal lath. ALX eliminates plywood seams and is ideal for use in heavy traffic areas. Westcoat’s MACoat is a fiber lath reinforced deck system engineered for use on elevated concrete and reinforced plywood walking decks. When sealed, MACoat offers a durable waterproof coating specified for use on balconies, corridors, stairs, plazas, and landings. 20-21 expands and contracts with normal structural movements to protect concrete from water and chemical seepage. Durable and waterproof, the 20-21 system can be used over plywood or concrete and delivers an elastomeric, chemical-resistant coating appropriate for plazas, balconies, helicopter pads, walkways, stairs, and parking structures. With each application of these products you have the option to choose from many different colors and styles to help you achieve exactly what you are looking for. Durable and long lasting, Westcoat Waterproofing systems will give you a look and feel that will last. Westcoats epoxy coating system are specially formulated for high-build applications. Designed for use in areas such as industrial floors, restaurant kitchens, schools, hospitals, garages, and warehouses. This water-based 100% solid epoxy system offers a long lasting system that is easy to clean. The right epoxy for each and every job with Westcoat systems that offer a complete line of industrial epoxy floor coatings. Designed to be used on concrete, metal, masonry, or wherever a tough chemical-resistant finish is needed, Westcoat industrial Epoxy Floors provide high build, high gloss, durability, excellent chemical resistance, and maximum toughness. 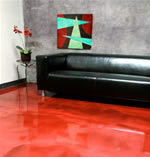 Create brilliant metallic effects with liquid Dazzle, Westcoat’s premier decorative epoxy floor coating system. Engineered with proprietary metallic additives that uniquely flow when applied, Liquid Dazzle produces a dynamic color changing custom floor that is decorative and highly durable. Simulate the elegance of granite or terrazzo floors. Westcoat’s Liquid Granite and Liquid Terrazzo systems combine epoxy and color chips to create seamless, decorative floor coatings. Designed for use in showrooms, restaurants, garages, recreation rooms, washrooms, and kitchens, Liquid Granite and Liquid Terrazzo coatings are chemical resistant and seamless, perfect for both residential and commercial applications. A durable, seamless epoxy coating system for pool surfaces, Westcoat’s Pool Chip is a cost-effective alternative to pool plaster removal and replacement. Pool Chip is sealed with a clear, UV-and chemical-resistant CRU topcoat. Ideal for both residential and commercial applications, the Pool Chip system delivers long-lasting wear and is easy to clean and brush. Resurface unsightly concrete. Westcoat’s Epoxy Stone system enhances patios, driveways, pool decks, and walkways with the look of rich, river polished pebbles. A scientifically-formulated, two-componet, 100% solid (no solvent), high-strength adhesive epoxy resin, the system is designed for the ultimate bonding of pebbles to structural substrates. With a complete line of industrial epoxy floor coating systems, Westcoat provides a high build, high gloss, durable product with excellent chemical resistance and maximum toughness. Westcoats concrete stain and surface coatings help create a rich beautiful surface that will add color and style to any concrete surface. Designed for and used in showrooms, restaurants, cafes, breweries, pool decks, patios, driveways and residential interiors. This customizable surface coat product helps to deliver a wide variety of styles and applications to any concrete surface. Create rich, beautiful surfaces. Westcoat Concrete Stain systems are available in both acid stain and water-based stain, giving artisans and designers unlimited decorative options. Used in showrooms, restaurants, cafes, breweries, pool decks, patios. driveways and residential interiors, Westcoat Concrete Stains add color and vibrancy to any concrete surfaces. Westcoat Sealers are ideal for general concrete sealing and maintenance of everyday areas. Fast drying and long lasting, the Westcoat line includes water-based hybrid acrylic urethane, solvent-borne urethane, and solvent-borne acrylic lacquer sealers. All sealers may be used with Westcoat Safe-Grip for a desired non-skid finish. The 11-10 system combines the strength and bonding ability of EC-11 Water-Based Epoxy with the durability and ease of use of SC-10 Acrylic Topcoat. Easy to clean, wear resistant, and low sheen, 11-10 resists alkali and moisture and is equally suitable on concrete, metal, masonry, or wood. Designed to be used as a maintenance coat for many Westcoat systems, 11-10 is also appropriate as a durable coating on patios, balconies, pool decks, driveways, and other vehicular surfaces. With so many options to choose from, sky is the limit when it comes to design. Westcoat concrete stains and surface coatings are available in a variety of unique colors that are appropriate for any project. Westcoats texture coating transforms regular concrete into a work of art. From the look of flagstone, slate, stone, pavers, tile, you can create and design a look that is all your own. 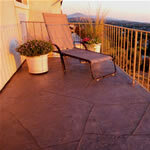 Created to work on old or new concrete, this product line beautifies an area to look like natural stone or tile. Resurface and beautify existing concrete with Westcoat’s Texture-Crete, a series of polymer modified cementitous coatings designed to infuse with concrete. 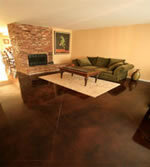 Texture-Crete transforms plain concrete into a durable smooth or textured finish. Easily simulate tile, flagstone, slate, and more with a variety of Westcoat finishes. Create the look of brick, slate, flagstone, tile, or stone. Westcoat’s Stamp-It is a 1/4″ thick polymer modified cementitous overlay designed to permanently transform plain and ugly concrete into a beautiful, decorative surface. Designed for use over existing substrates, such as pool decks, patios, driveways, walkways, and countertops, Stamp-It is appropriate in both commercial and residential environments. Perfect for patching and filling holes in concrete or magnesite, Concrete Patch can also be used to slope or build up low areas when installing Texture-Crete, ALX, or MACoat systems. Durable, beautiful and long lasting, Westcoats texture coating system comes in a variety of style and colors that is perfect for any application. Used in driveways, walkways, patios, garage floors, courtyards, and pool decks, the uses and application are endless.